This July 2019, marks the 7th year anniversary of adopting my piggy. My Chowder, a 230lb “minipig”. I would be so delighted to go into all the revelation of love this pig has given me but I guess that would make this a long story rather than a blog! When I sought out to adopt a pig I had heard of micropigs, teacup pigs. I never thought that a pig could be small. I read anything and everything I could get my hands on about them in order to prepare myself for piggy motherhood! I found that so called micro pigs where actually pigs who’s bodies were bred continually to stay small, yet their internal organs continue to grow in which at approximately 5 years old they die an agonizing death. I read that “tea-cup” pigs are actually baby pigs and about how many of these pigs are purchased, continue to grow (pigs grow until they’re 4 years old) and once they’ve outgrown their persons expectations are abandoned. I’d made the decision that even if the pig I was planning to adopt turned out to be as large as what are referred to as a “farm pig” I’d find a way to accommodate him or her and do everything in my power to give them a fulfilled life. When I found Chowder, then, named Porkchop and thought to be a minipig, he was about 4 months old and was already being rehomed. I was ready to give him every good thing! I was ready to teach him, to love him, to show him patience and understanding, and to strive for more so that I could give him more. I’ve often said on my instagram posts, I am forever in this little pigs debt for all the amazing things he has taught me and for the revelation of love, and depths of it! The compassion, the selflessness, and true hope and devotion that he has taught me. He was the one who taught me what kind of human I wanted to be. He also made me conscience of what I was eating. He stood in the kitchen with me one day…staring up at me in a sitting position with his beautiful Dr Pepper colored eyes and his toothy grin as he asked for a treat. He was just over one year old. I decided that I would never consume meat again. Pigs understand love, dislike, and even forgiveness. That’s tremendous! Seeing Chowder enjoy his days was amazing…he wanted to be challenged, to learn, to be busy, to bask in the sun and to be fed on time. Sure, he was selfish, he was demanding, and he was moody at times… but I loved everything about him! I decided in a moment that I’d never have anything to do with taking that right from any living thing like Chowder. The outpouring of love and devotion I have towards him and all of my animals makes life worth living, and I am so thankful that I have been blessed to be taught true love through the love of animals. Meet Shelby Madere! Shelby is Mom to one of our favorite pigs of all time Chowder! Check out her story about one pig who changed her life and a whole lot of others! 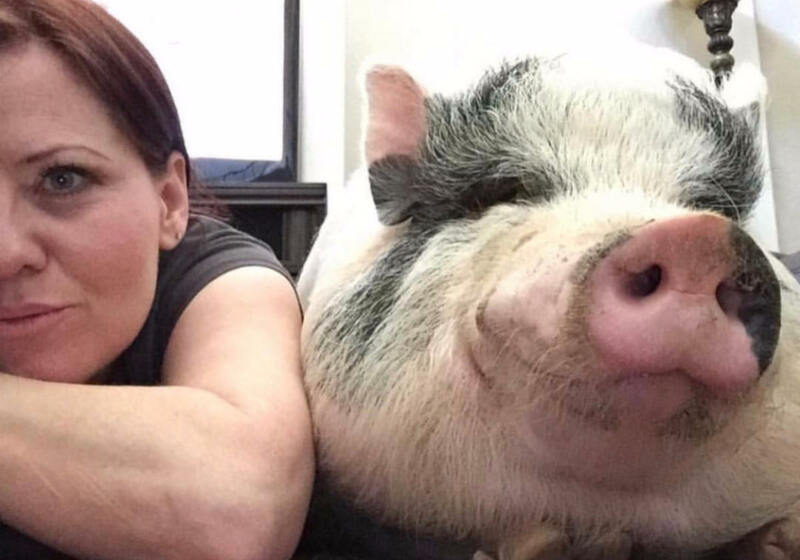 After adopting her pig, Shelby became a huge voice for potbellied pigs, veganism, and has helped to network animals into Sanctuaries all over California! She has now even bought a large plot and brought in two donkeys and a second pig. Her space with hopefully home many more over the years! Shelby is responsible for networking quite a few animals to our sanctuary including our first piggy, Rudy.